Sundays are perfect for skin care rituals. In the past, I would end Sunday evenings with an at home facial. But somehow, I fell away from that habit. Today I decided to reinstitute the ritual thanks to some major inspiration from Jourdan Dunn. Earlier this week, I posted the full run down of her entire day time and nightly ritual. But I thought I'd save the best for last. Because not only does she have a solid morning and evening routine, Jourdan also developed a unique Sunday night ritual as well. Since today is Sunday, it's highly likely that tonight, Jourdan will settle in after a long, wonderful day, and commence to execute her Sunday evening skin routine. Let's see what's in her line up. To start the process, Jourdan removes impurities with the Moringa Cleansing Balm. This cleansing balm comes highly recommended by various beauty bloggers. It gently removes makeup while keeping the skin soft and hydrated. It seems like everyone who's tried it, loves it. I promise you that I'll have this balm in my possession before long. Once her skin is clean Jourdan exfoliates with Peter Roth's Pumpkin Enzyme Mask. We've discussed the goodness of fruit enzymes in the past. Fruit acids are especially important because they weaken the connection between dead skin cells. Once the connection is weakened, your dead cells are easily removed without disturbing the live ones. It's a gentle, yet effective exfoliating experience. The reviews are overwhelmingly positive and, compared the rest of her regimen, this pumpkin mask is a bit more on the affordable side. Next she steams her face using Skin Owl Beauty Steam. At first glance, Beauty Steam looks like loose leaf tea. But, instead of drinking it, you add the leaves into a bowl of hot water. Then hold your face over it and allow the herbal extracts to treat your skin. I'm pretty sure the herbal ingredients also add a soothing aromatherapy aspect to the Sunday night facial experience. With her pores now open, Jourdan reaches for her Skin Perfecting Clay Mask by Dr. Sebach. Next she follows up with a hydrating mask from Skinceuticals. This skin nourisher is loaded with hyaluronic acid and vitamin B5. I like the idea of employing a hyrdator after a purifying clay mask. We've all had that experience of dry tight skin after a deep pore cleanse. I usually counter balance it with toner but a hydrating mask makes much more sense. Although I'm intrigued by the idea of using a moisture promoting, gel mask, I'd much rather use a serum soaked sheet mask instead. Once her skin is good and hydrated, Jourdan follows up with Estee Lauder's eye serum and her favorite moisturizer (Pixi's Beauty Sleep Cream). 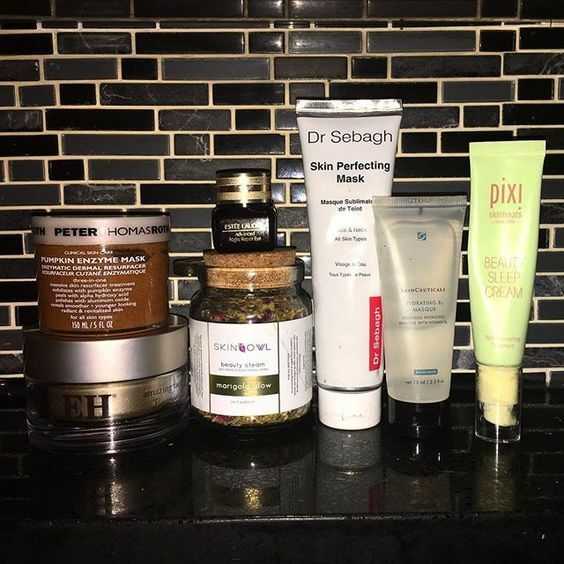 Jourdan's Sunday night skin regimen is simple but well thought out. She's inspired me to reinstitute this practice as a way of properly closing out the weekend. Until I get my hands on the cleansing balm, I'll pre-cleanse with coconut oil. Basically, I massage my skin for several minutes with the oil, to loosen dirt and promote blood flow. I have some chemical exfoliators on deck but would love, love, love to try a fruit enzyme based exfoliator like our homie Beyonce does. Thanks to Jourdan, I've already treated my skin to a nourishing facial. One takeaway from tonight's in-home facial is realizing that, while my skin looks ok, I could feel congestion beneath the surface. This needs to be addressed immediately. From past experience, I know that I need to get back to steaming at least 2X a week. Especially now that I'm sweating more than normal and my oil glands are out of control. When I worked in corporate America, Sunday nights were a bit stressful (with Monday fast approaching). Facials were a way to ease my anxiety while promoting healthy skin. It was my favorite thing to do on a Sunday evening. If you haven't had the pleasure of indulging in Sunday night facials, I urge you to make it a part of your self care ritual. My comment has nothing to do with this post but I was reading your monday motivation and business posts and was trying to understand if you blog full time and have another business, or your blog and the tea are both your business? Your advice on business and motivation is awesome! Thanks! Yes, I manage the blog full time & I launched Beautifully Bamboo as well. That's really inspiring and gives me context from now on when I'm reading your posts. Tks for answering! This is inspiring my Sunday! 48 dollars seems like a lot for dried herbs in the herbal owl steam blend. I like the idea but it seems like the same product could be recreated or enhanced on your own by visiting a herbalist, and for far cheaper. I kinda agree with you on that one. And you're right, creating a DIY version would make much more sense.